So, I sat at the top of the hill at the entrance to the park and did this piece on a recent beautiful spring day. An assortment of adults, dogs and yelling children wandered in front of my view, but thankfully none stayed too long. One guy was doing some rather intense bursts of exercise on a mat on the grass to my left. His dog sat dutifully next to him and watched the frantic up and down movement. I tried not to look, but there was so much huffing and puffing. Finally, they left and I stayed in the shade there until my paints were in the sun and drying out too fast. (As the water evaporated from the color pools I had mixed, the colors were changing, and not in a good way.) Anyway, in the 45 minutes or so I was there I got what I wanted—a row of palm trees, “greens galore,” people way off in the distance and a road. As I thought about what I would say in this post, a number of my reoccurring “life as art” themes popped into my head. I could write about rows of palm trees and my obsession with that kind of pattern and symmetry. (I also like the pattern and symmetry of rows of wine grapes.) I could write about the importance of what’s behind what you are painting and how that can be just as worthy of attention as what’s front and center. Or I could write about why a prefer landscapes and plants to people (hence my annoyance with the yelling, and huffing and puffing at the park and why I put only a couple of them way off in the distance). But I think I settled on my fixation/obsession with roads. When I paint it’s not relaxing. I all but vibrate with the planning, mixing of colors, and then the actual execution of my art. I’m always about 70% certain how I want it to look when I’m done, with the rest a wonderful accident of color and placement. I imagine what color should be next to another for a certain effect, or what color should be under another, or where the white spaces should be, or even how I will add some kind of pencil or watercolor crayon as a final touch. You see, I also get bored easily and need to get it all out and on the page before I am just over it and want to be done. Because there is nothing worse than going too far and overworking a piece. Oil is a little more forgiving as you can just paint over something you’ve changed your mind about. But watercolor is in the moment and there is no turning back once you start that first color wash or lay down the intense dark shadows. So, with all this thinking, planning and self-doubt about whether I can accomplish what I want before the timer goes off in my head, I think about places of rest on the page. My skies give my brain a break and allow me to take a few moments to wash in some soft blue relief. But I also include more terrestrial respites with the roads that run through much of my art. There is something quite calming about the soft grays of concrete next to a jumble of wildflowers or vineyards. Concrete grey next to soft green lawn is also a place for me to stop and rest, and wait for paint to dry. Roads are also important to most of my landscapes as they are meant to take me somewhere–through a countryside and into the hills and beyond, around a corner to a surprise or just onto to somewhere else. I have always lived my life trying to be “under the radar” and not wanting to be noticed. So sometimes the roads in my art are like a backdoor to an unseen place. Note about my handsome younger brother: My brother recently put the wheelhouse from a tugboat in his backyard. He found it sitting near the waterfront in Sausalito. I guess the tugboat had sunk in the bay and the owner had it brought it up. It was just sitting there, waiting for my brother. And it was free! Of course my brother had to pay to have it brought to his house in Sunnyvale and then lifted by crane over the house to the backyard. Now it sits there, in a sea of concrete. I think he uses it at his man cave. It’s a place where he can be alone and smoke cigars. Last I heard he was planning to put a ship’s bell inside. I can’t imagine why he would ever want to ring the bell. Maybe if some cigar ash dropped in his lap he might grab the bell pull by mistake…I can’t imagine why anyone would want to ring such a thing on purpose. Happy Birthday Brian (June 29th)! Wildflowers from Ruth’s garden—feverfew, Canterbury bells, scabiosa (pincushion flower), sweetpeas, and larkspur (Watercolor on cold-pressed illustration board). This is a photo of a color copy as I gave the original to Ruth years ago. Who is a special person in your life? Is there someone in your life you were destined to know and did fate bring you to that special person? Is there someone in your life you’ve met over and over again, with a kind of questionable randomness? That was my destiny/fate with Ruth. I grew up in the Silicon Valley before it was called the Silicon Valley. Back then my dad was an electrical engineer and he worked at various start up companies in Sunnyvale, Mountain View and Palo Alto. During this time semi-conductor chips (known as Silicon chips) were actually made there. For fun, my family would pile into the station wagon on a Sunday afternoon and drive around the area looking at new tracts of homes that were being built. I vividly remember the fruit trees they were taking down to put in these huge developments. And I can definitely see in my mind’s eye the amazing tufts of blossoms of the cherry, apricot and prune plum trees–floating a few feet above dark trunks sticking out of the ground. When I was 10 or 11, my family and I were living in San Jose. A friend from school had family in the Paso Robles/Atascadero area and one summer I went with them to the San Luis Obispo County Fair (now known as the Midstate Fair). My friend’s grandma was in charge of the fruit and vegetable building during that event. Her helper was a handsome, tall woman with sandy-colored hair. Her name was Ruth. I don’t remember much else about Ruth, but I was impressed with her knowledge regarding the fruits and vegetables the people were bringing in to be judged for the fair. Fast forward past my graduation from Lynbrook High School in San Jose, and then to my final quarter at Cal Poly, San Luis Obispo. I was getting my teaching credential (to teach elementary school) and was assigned to a kindergarten class in Atascadero as a student teacher. Guess who was the classroom aid for that assignment? Yeah, it was Ruth! And I hadn’t seen her since those couple days at the fair 10 plus years earlier. She was still a tall handsome sandy-colored hair woman. Now, this time I actually got to know her, and went to her house and met her daughter. Ruth lived on the top of a hill in Atascadero. There, she tended her walnut trees and drifts of brightly colored flowers tucked into every possible sunny spot in her garden. Her husband was a mason and had built their house to look like Noah’s ark. I can still picture in my mind that great ship floating in a sea of roses, golden sunflowers and hollyhocks of every color. Fast-forward another 10 years. Now I am back in school studying engineering at Sac State, because I don’t really want to be an elementary school teacher. My lab partner in a physics class was a very cute tall young man with sandy-colored hair and he told me of his Aunt Ruth who lived in Atascadero. Could this be the same Ruth I had previously met in two completely unrelated events? And the answer was YES! It was she. So, a couple years later I married the cute guy with the sandy-colored hair, and became her niece by marriage. And to seal the deal we had a son (with sandy-colored hair) and now she and I are linked by blood through him. She was one of the first people that came to see me after he was born. I have an amazing photo of him visiting the ocean for the first time (he was a year old) on the beach in Cayucos in front of her darling red-shingled house on the small cliff above the sand. Her nephew and I got divorced, but that doesn’t change the fact that a series of seemingly random events connected me to her forever. And I am forever grateful that the fates brought us inexorably together with my cute tall handsome sandy-colored haired boy. I love you Ruth! Note about Ruth and her garden: Ruth is an amazing gardener and has more great grand kids than I can count. She takes flowers from her garden to sell at Farmer’s Market In San Luis Obispo most Thursday nights and has been doing that since the mid 1970s. I remember her telling me that one morning she cut over 300 daffodil stems to sell at Farmer’s Market. I can almost picture that tall handsome woman, with the sandy-colored hair, standing under the huge walnut tree next to her ark amongst the steel flower buckets filled to bursting with bundles of bright yellow. I hope you are lucky enough to have such an amazing person in your life too. My son was diagnosed with type 1 diabetes in early June 2008. He was 13. We were getting ready for a 3-week trip that I was calling, “Mostly Lewis and Clark.” The plan was to go from Grass Valley north on 5 through Oregon, then pick up their trail and head east along the Columbia River Gorge, across the northern tip of Idaho and on to Missoula Montana. It was at this point we would exit the trail of Lewis and Clark and head south to Wyoming and Yellowstone, then west through Nevada and home again. Ten days before we were to leave on our epic trip my son was diagnosed and together we spent a couple days and nights at a Sacramento Hospital. During that time we met a number of medical professionals and support staff that helped us get educated about what it meant to have type 1 diabetes. We were both reassured that a person could have a normal life if you just pricked your finger to check your blood sugar 5 or more times a day, ate a healthy diet, counted your carbs, got regular exercise, and oh yeah, learned to recognize the symptoms of high and low blood sugar and give your 13-year old self a shot with the correct dosage of insulin when needed. So, we left a day later than planned, but we went anyway. I needed to prove to myself, and especially to my son, that life would go on and he could do the same things as anybody else. We had a great time on our vacation, by the way, but our lives (especially my son’s future life) were forever changed. Fast forward to Christmas 2008 and then Christmas 2009. During two weeks before Christmas 2008 and for two weeks the following Christmas time my son participated in a drug trial study related to his diabetes at UC San Francisco. I bunked in with him in his hospital room for both stays. During his second round of the study I entertained myself with a variety of projects. I made little felt Christmas elves, planned a trip to Italy for the summer of 2010 and did a couple paintings of the various views from his hospital room (he had the same room both years). I stood at his window one day and did this one. It’s of the top of the de Young Museum, swimming in a sea of green trees in Golden Gate Park. Another day I painted from that same window a view we had of the Golden Gate Bridge. Yeah, something you might see on a post card that might say, “Wish you were here,” or maybe not. I also spent a lot of time watching the fog, rain, and day and night come and go from that window. We had a number of follow up appointments at UCSF for a two-year period in between those two December stays. I wanted to be sure my son didn’t resent our frequent trips from Grass Valley to San Francisco, so I made sure we had fun when we were there. What was I thinking? This was San Francisco—a beautiful city that had enchanted me before when I had lived there in the 80’s. We stayed in cool hotels all over the city and made many trips to the park. We even joined the recently remodeled California Academy of Sciences. We frequented the Rain Forest exhibit there and hung out in the Steinhardt Aquarium, watching our favorite albino alligator names Claude lounge on a heated rock in his very special enclosure. My son was hooked! He is now 22 and plans to live there as soon as he can. Yes, I know that will be a tall order because I think everyone in the world has heard how expensive it is to live in San Francisco. Gee, thanks Google! Needless to say my son still likes to show me amazing million dollar condos and lofts he finds online. Yeah, he’s hooked! This is the companion piece that goes with my One California Girl logo. 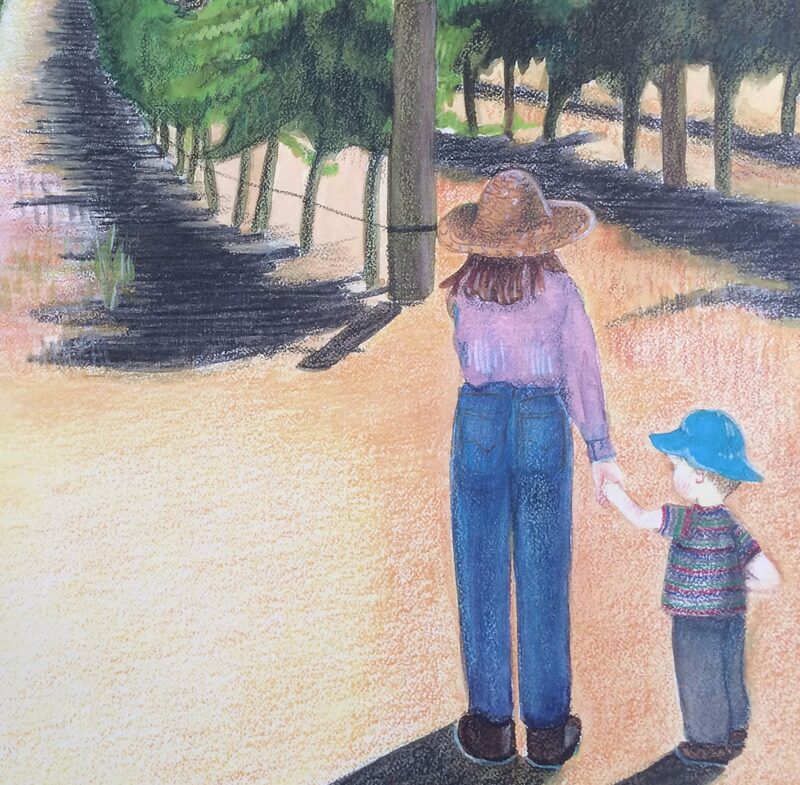 It’s what’s on the left of my son and I, showing the beauty and structure of row upon row of grapes with room for a sturdy oak at the top of a hill. I like to think that oak was left so the viticulturist and vineyard workers would have a shady place out of the sun to eat lunch. I am obsessed with vineyards and have done many paintings of grapes plants and oaks. When I was young there were no large tracts of vineyards in San Luis Obispo County like there are today. There was one winery off highway 46 on the way to Hearst Castle. It was called York Mountain Winery and was established in the late 1800’s. In 2003 it was condemned after a catastrophic earthquake, and reopened again in 2010 with new owners. My young memory of the north county area did not include wine grapes, but rather acres and acres of beautiful golden safflower. Also on that side of 101 (in Adelaida and Klau) were acres of walnut and almond trees. Before there was an official 101 there was the El Camino Real (The King’s Highway). At the turn of the 20th century, on the east side of the old King’s Highway (near J Lohr and Estrella), the farmers dry farmed wheat and watermelons. (Many families still grow watermelons during the summer out by the airport.) Then there was a time those farmers were paid not to grow anything. And then came the wine industry and all those hills are now covered with wine grapes, with small boutique wineries scattered around. When I was young the huge fields of wine grapes was in the Napa Valley. And as a girl there was no shortage of wine from Napa wineries served at dinner in our home for friends and family. In fact, when I turned 21 my parents took me wine tasting along 29 (from Yountville to Calistoga). I had just come home from living in Munich for a year and was studying art at UC Berkeley. So, early one Saturday morning (after I had actually turned 21) they took me tasting. It was a hot dusty day and road, and I don’t really remember much of the trip. I do remember that it was too hot to enjoy drinking room temperature wine, no matter how famous the vintner. I seem to remember my brothers and I drank a lot of iced tea and lemon aide—yeah they were there too. But I do remember the cool Beringer wine caves and the beautiful setting of row upon row of wine grapes and oak trees at Inglenook. Back then no one would have thought to charge for tasting wine. It was kind of like the farmer’s market tradition of tasting melons, peaches and grapes before buying the fruit and it was all free. Note about a movie featuring Napa in the 70’s: A movie called “Bottle Shock” came out in 2008. It’s a great true story about how California wine became world renowned after it was compared to French wines in a blind tasting conducted in France. The story has a kind of David and Goliath feel, where a small family-run winery (with the help of a UC Davis grad student) soundly beats almost every French wine it was up against. The story is fun and the scenes of the rolling hills of vineyards dotted with oak trees can feed my obsession for those views. It was beautiful then and now, and such landscapes can still take my breath away.